“Crimes Against Logic” is written by Jamie Whyte, a person with an eclectic career including that of a philosophy professor, management consultant, politician and author. The closest parallel I could find for his incisive style of writing is Richard Dawkins though the subject matter is vastly different. 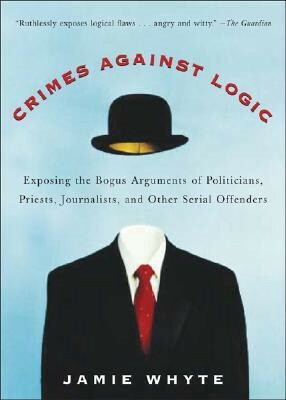 “Crimes Against Logic” is a book intended to help people identify errors of reasoning in their day-to-day lives. The book uses several real-life examples from politics, theology and business to explain these fallacies. “Crimes Against Logic” covers 12 fallacies. The fallacies covered range from the fallacy of equivocation to the use of empty words (jargon) and from the Authority Fallacy to statistics. Each chapter is devoted to a fallacy. Jamie Whyte starts each chapter by explaining what the fallacy is. He gives an example to make it easier to understand. In addition, he then covers the most common variations of this fallacy, with each variation in its own sub-section. For example, in the chapter on ‘Empty Words’, he explores ‘Jargon’, ‘Weasel Words’, ‘Hooray Words’ and ‘Quotation Marks’ as variations on the same idea i.e. using verbiage to divert or stop the discussion. Jamie Whyte is witty, incisive and devastating in his writing. In fact, I wouldn’t mind reading fiction written by him in this manner. He uses this style very well in his explanations of the various fallacies. Readers might also like the various sub-themes and anecdotes used to drive home the point. They are entertaining, if nothing else. “Crimes Against Logic” does not eat its dog food. Unfortunately, the various fallacies covered in the book are also in the book. At times, I felt that I was reading a parody of this book. Jamie Whyte is quite inconsistent in his explanations and commits the same sins he accuses others of. At times, I felt a bit divorced from what was happening. This is not something I usually experience. When I retrospected, I realised that this was probably due to the author’s personal rants coming through which was being disguised as serious reading. The other issue I have with this book is that I don’t feel enriched for having read it. I tend to have a soft spot for books which deal with the subject of making people self-aware and more rational in their approach. I had high hopes from this book and am quite disappointed after finishing it. While this is a decent starter book on Logic, there are plenty more out there which do a better job. In fact, this wiki page on fallacies does the same job for free.